Camera 1 is the earliest in my database. It has gold trim control wheels, 75 mm Lumaxar lenses, bent strap locking lever, early nameplate shape and MX shutter. Cameras 2 and 3 are two earlyish examples with moulded locking levers, the first with 80 mm Lumaxars and gold trim control wheels (also found with the later control wheels) and the second with early Yashinons with black leatherette insert control wheels, say late 1957 to 1959. Cameras 4 and 5 represent middle age (late 1959 to around 1965) with first black radial control wheels and then the dull silver. 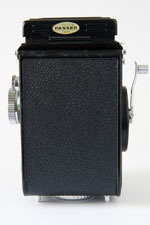 Camera 6 is mature age with the late hood logo and shiny control wheels, starting from about 1966. This example is from 1969 from just before when f/2.8 viewing lenses were introduced (around 1970). 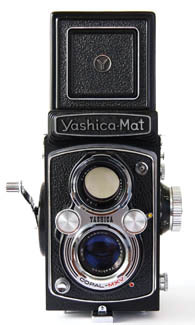 The last Mats with f/2.8 viewing lenses also received black plastic locking knobs, courtesy of the Yashica Mat-124G, and a textured nameplate (see the Yashica 635 model). Some sources claim production ended in 1971 but by my serial number analysis, it seems to have been March 1973. 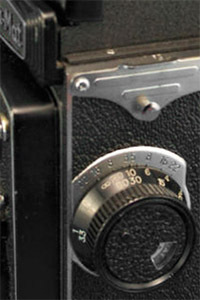 Note the style of the camera's nameplate with the more pronounced top and bottom curves and longer tail on the “Y”. The top nameplate on the right belongs to an example with 75 mm Lumaxars and MXV shutter already. This probably changed to the later type with the introduction of Lumaxar 80 mm lenses but still with gold trim on the control wheels. Below it is the revised shape already found on a Yashica-Mat with 80 mm Lumaxar lenses and black leatherette control wheel inserts. 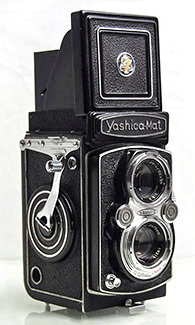 As well as the auto-cocking crank-wind, the Yashica-Mat was the first Yashima made model to adopt the Rollei-like aperture and shutter speed control wheels. There is general consensus that the Yashica-Mat was released in April 1957 and that coincides with the appearance of the first advertising. The 1957 Yashicaflex AS (new model) and B (new model) and the 1958 Yashica D and Yashica 635 are very close relatives except for the Mat's crank advance and 4 element taking lens. Those models already feature the new moulded locking lever but all the Lumaxar 75 mm equipped Mats had the earlier bent strap locking lever before the later type arrived with the first Lumaxar 80 mm lenses. One other first for Yashima was the introduction of a combined ASA/DIN scale film reminder. 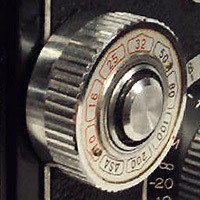 Different to the later simplified knob-wind version, this is located on the focus knob, now on the opposite side and employs two opposing windows, one for the film speed in ASA and the other in DIN. The genealogy of the Lumaxar and Yashinon 4 element Tessar type lenses is discussed on the Lenses & Shutters page where I state my belief that the pre-war Tomioka 4 element Tessar type “Lausar” is the forefather of both Lumaxar and Yashinon lenses. Post-War, it is known to have been used in 75 mm guise by at least one other TLR maker. Note however, the 1957 US ad further down states that “Yashica management searched far and wide for lenses befitting this masterpiece of camera engineering.” Is that US marketing speak for looking through Tomioka's catalogues or does it really mean “far and wide”? Even so, it doesn't mean that they didn't come back to Tomioka, particularly as there is no mention of exotic names and/or locations. Note that viewing lenses are triplets, initially with “View-” in front of the Lumaxar and Yashinon but then dropped in 1964 (see also page from 1957 Japanese brochure below). The 80 mm version of the Lumaxars replaced the 75 mm very quickly - the Japanese brochure below confirms that happened during 1957. In fact, the Japanese user manual above was printed in March 1957 and already contains schematics of 80 mm lenses, including Tessar type taking lens. There is an ad in the July 1957 edition of Dutch publication De Kampioen (accessible from Google Books) which also already features the 80 mm type. By serial numbers from the first 75 mm to the first 80 mm types is about 7,000 cameras, not unreasonable for 2 to 3 months production for a very popular model at introduction. According to my database and if my serial number theory is to be believed, the last Yashica-Mat with Lumaxar 80 mm lenses was produced in December 1957. 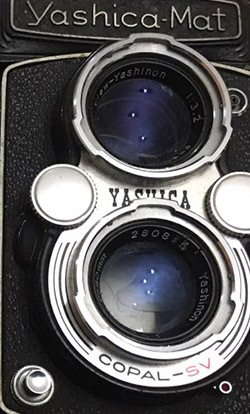 However, this is the strange thing, there are no Yashica-Mats in my database for 1958 until June when the first confirmed with Yashinon lenses appears and then they appear again at about the rate of 4 or 5 per month. If there really was a break in production, some may think that supports one of the competing Lumaxar sourcing theories. It is possible of course but I think that it is more likely that excess stock had built up and there were other new models competing for production line space; the Yashicaflex AS, B and A (new models) in 1957 and Yashica 635, D and B in 1958 and the ongoing Yashica A, C and LM production. Perhaps space was needed to be rearranged for production of the new Yashica 8 movie camera and Yashica's coming forays into 35 mm and sub-miniature formats. 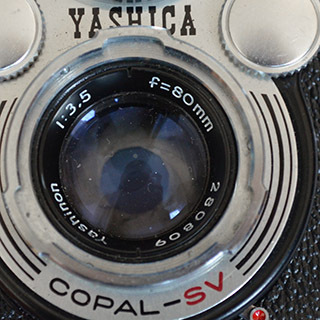 Rather than the break being a result of the lens changeover, the change of name could have been decided during the break to better reflect Yashica's ownership of the product. 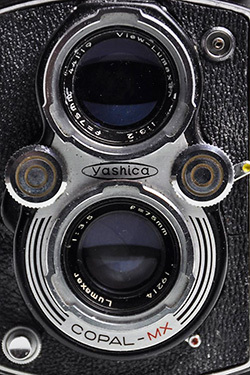 In fact, “Yashinon” named lenses seemed to arrive first on the Yashica 35 35 mm camera in April 1958 and on the Yashica 8T/8T-2 movie camera in May or June 1958 and with both cameras, the first examples were actually called “Yasinon” - none found on the Mat yet. 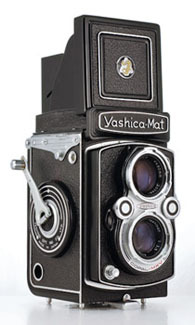 Approximately 2/3 of the Yashica-Mats in my database are pre-dual scale focusing (pre-1960). Of these, approximately 85% of cameras have feet focusing scales indicating a very strong export focus and for that matter, many of the metre scaled examples could have been intended for Europe. Is the Yashica-Mat a Rolleiflex Clone? Not really. This is discussed in more detail in Design Heritage and Recipe for Success. The Yashica-Mat bears a strong physical resemblance to the Rolleiflex and operates in much the same way but the construction and mechanical design is typical Yashica 66. Hence, there is a much stronger design connection to the Rolleicord rather than the more upmarket model. Think of it as a Rolleicord with crank wind. What does this mean? I am fairly certain that no production model looked like this. In my view the possibilities are that the photo is of an early mock-up or prototype or that the photo is a montage created by Yashica, the importer or the ad agency. Surprisingly, the same image reappeared in a Molander & son ad run a year later in the May 1958 edition of Foto. As the correct image was used in the earliest ad, which just happened to coincide with the model's release, my assumption is that the images in the later two ads were simply inserted by mistake (the May 1958 ad has a lot of other discrepancies as well, including misspellings of “Lumaxar” as “Luxamar” and suggestions that both the Yashica C and LM were also fitted with these). In that case, there seems to have been little reason to create a montage. Supporting this view is the fact that the lenses already have the Lumaxar name complete with serial numbers in matching style. Not easy to do in the pre-digital era. To counterbalance that argument, there seems to be some manipulation going on - the top front of the circular crank housing looks like it has a portion of one of the two inner rings copied and pasted (in digital parlance) onto the edge - see the red circle. However, if the picture is a fake, where was the crank and housing copied from - the rest of it looks real enough? Rolleiflex? Surely not from a “real” Yashica-Mat - why bother? And the unique strap holders look rather nice too. 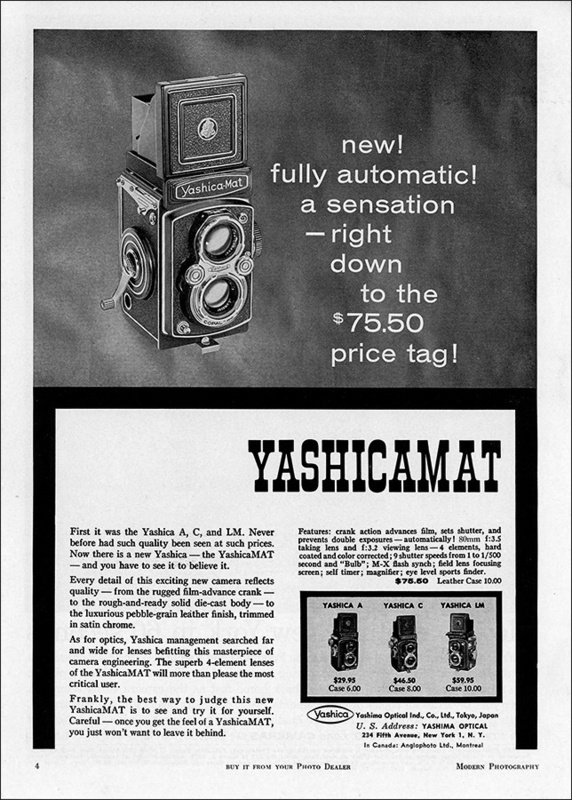 But then the “mat” at the end of “Yashicamat” doesn't look quite right and the crank housing doesn't sit out from the back edge of the body like it does in the first ad - the images have similar perspective. Although the perspective of the crank housing itself could be wrong. And on and on. There is nothing conclusive either way. It is possible we are seeing an accidental glimpse of Yashica development activity that the Swedish importer may have had access to, but at worst, it is an interesting example of mid-1950s advertising trickery and stuff-up. "A Yashica-flex Automatic camera with crank-operated film transport and shutter-cocking facilities, M-X synchronisation and shutter speeds from 1 to 1/300 second was presented by Intercontinental Marketing Co., at $79.50." 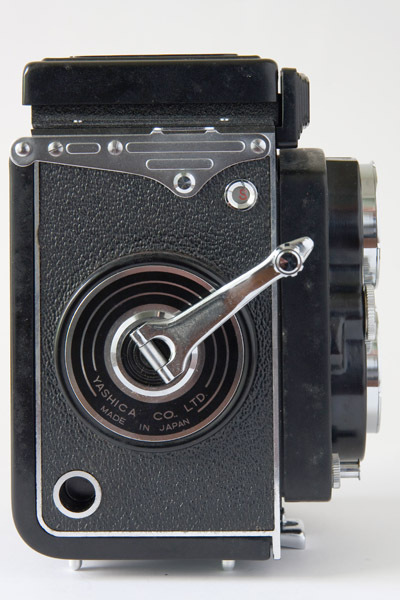 Given the reputation of the magazine, we have to accept that some form of Yashica crank wind model was on display and the price was in the ball park of the 1957 release. 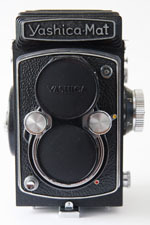 An early Yashica-Mat prototype, or was there an earlier version that is still to be discovered (unlikely, in my view)? Either way, did it look anything like the Swedish Yashica-Mat ad above? 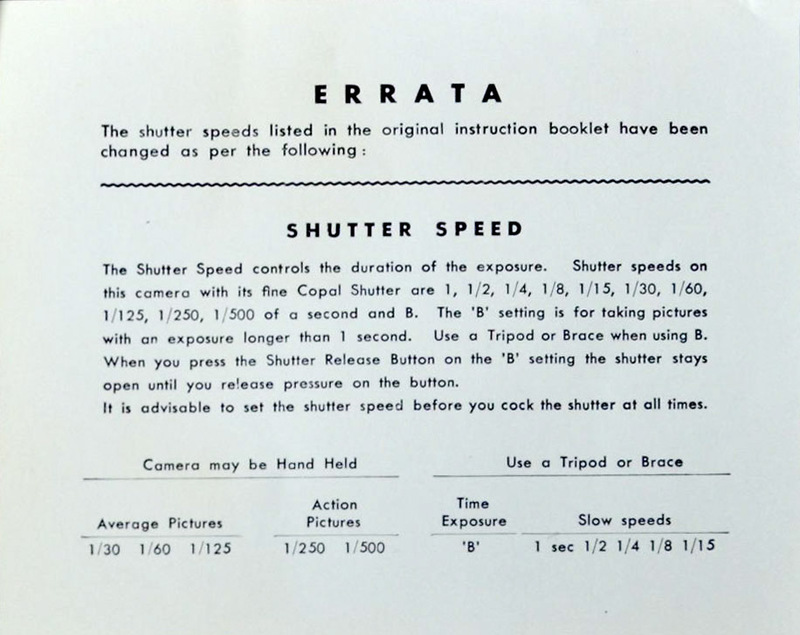 Below are excerpts from the earliest Yashica-Mat manual known. There are both English and Swedish language versions and the photographs are the same. The same camera is featured throughout both. The camera body number may be 570??. The lens numbers are clearly 18877 taking lens and 43560 viewing lens. All the numbers are only 400 or so below Göran's camera featured above and below. The camera features 75 mm Lumaxar lenses and Copal MX shutter. 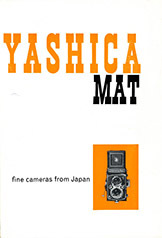 Inside the cover on the first page is “Yashica-Mat”. Same camera so which is real? The doctoring on the first page is competent but doesn't really match the rounded “a”s of the nameplates featured above and in the US ad below. If you click on the Swedish manual at the top, the parts naming page also shows a focus side view - the doctored text appears half-height. This must have been a late change. If this version had been released, I doubt that there would have been any attempt to disguise the fact. The early Yashicaflex AS user manual and its disguise of the Y.S.K. shutter was a similar, if much cruder example. The focusing scale in metres and ASA film speed reminder suggest that this is a domestic Japanese example. Like Göran's slightly later camera, there are no internal light baffles yet (see below). Undoubtedly, the “Mat” name is a contraction of “automatic” in some form. 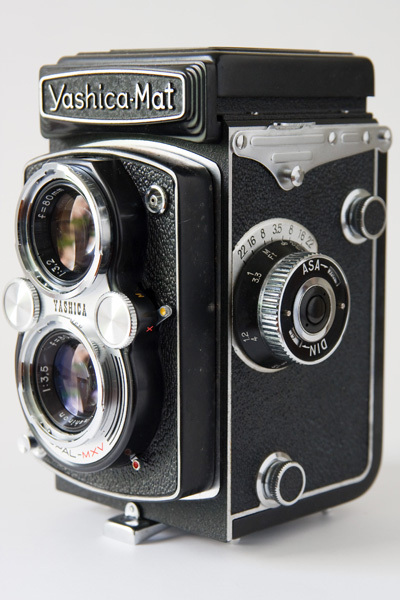 Of course, Yashica may have innocently been referring to the crank wind film advance with automatic shutter cocking whilst the cynical believe that it has more to do with the Rolleiflex Automat name, itself being a derivation of “automatic”. 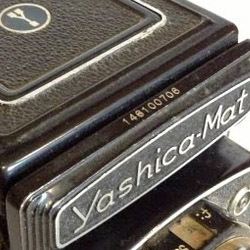 As noted above, the nameplate was originally going to be “Yashicamat” but was released as “Yashica-Mat”. However, for the first few years at least, the printed name on international user manual covers, certainly on English language ones, the text inside, on boxes and in ads said “Yashicamat”. 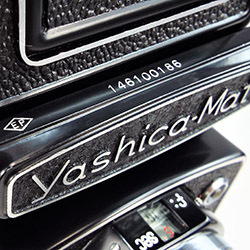 I see that more as a legacy of the original nameplate and associated printing etc that had been locked in prior to the format change and that Yashica was unwilling to incur the costs of changing everything. 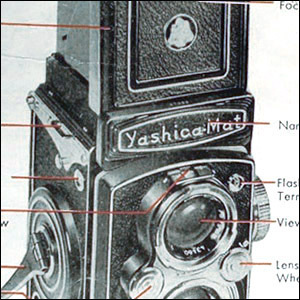 Later manuals, brochures and ads use “Yashica-Mat” and “Yashica Mat”, i.e. with and without the hyphen. 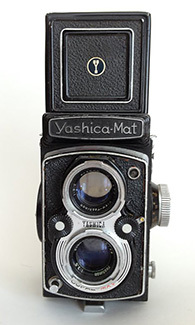 On this site, I use “Yashica-Mat” but there is no right or wrong. Japanese ads, brochures and the user manual distinctly separate the “Mat” as the Yashica model so I am not fond of applying “Yashicamat” generically. 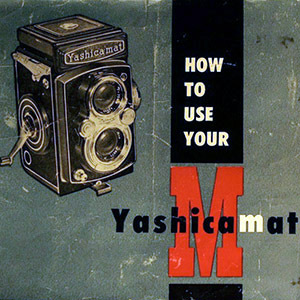 The cover of the 1957 Japanese user manual above has “Yashica” in Japanese and “Mat” separately in English. The machine translation suggests that it was printed on 25 March 1957 with an issue or publishing date of 1 April 1957. 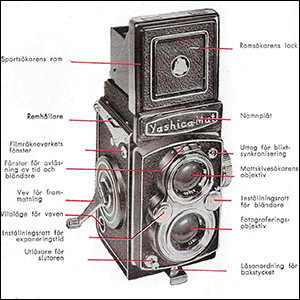 The page that displays the camera with numbered descriptions of the controls like the first pages of most Yashica user manuals actually uses the same doctored images as the first English and Swedish manuals but the Japanese booklet goes one step further - the word “DIN” and an additional film speed reminder window have been painted in on the the focusing knob. 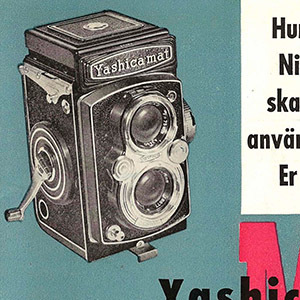 However, unlike the “Yashicamat” camera further inside the earliest English and Swedish language manuals, the Japanese booklet features a production type camera already. It is the very earliest Lumaxar 75 mm type with MX shutter still and no internal light baffles yet (unlike the brochure below). Strangely, a diagram shows both triplet viewing lens and Tessar taking lens schematics with a focal length of 80 mm. Given the printing and publishing dates, it seems clear that 80 mm was planned and 75 mm was an interim measure. Other aspects of this manual are discussed on the Ownership page. Note the claim, “Yashica management searched far and wide for lenses befitting this masterpiece of camera engineering.” I have addressed this claim further above and on the Lenses & Shutters page. On balance, I think that the lenses are based on the original Tessar formula Tomioka “Lausar”. Correspondent Norman Beierle initially alerted me to the fact that, unlike its slightly younger knob wind contemporaries with control wheels, the Yashica-Mat was first released with a Copal MX shutter. Plus the pre-production example, the five earliest examples in my database have the MX shutter instead of the commonly found MXV. The camera shown in the 1957 Japanese brochure below is still an early type with Copal MX shutter and 75 mm lenses whereas the description says 80 mm and other Yashica-Mat photos in the brochure are a mix with both 75 mm and early 80 mm lens types. The brochure also confirms that the viewing lenses are triplets and provides a clearer view of the baffles (as far as I can tell, only fitted to early cameras with 80 mm lenses) than the brochure further below (note that there are two almost identical versions of this brochure, one showing a camera with baffles, one without - the other version is not displayed on this site). Note that the screws on each side of the exposure window disappeared sometime between January and June 1962. It still has 10 aperture blades whilst all the other SVs found on Yashica TLRs have 5. However, unlike their German Compur and Prontor namesakes, the Copal MXV and SV shutters are very similar designs and the SV can be found with 10 aperture blades in other applications. At this stage, I am convinced that this is a genuine Yashica produced anomaly of some sort and that the very well looked after camera matches its equally well looked after original packaging and kit. The trim is the same and the taking lens number is less than 10 different to the first camera. Finding a second example from the same point in time is very significant from a provenance perspective but it doesn't help with answering any of the questions. There are not many photos of the insides of early Yashica-Mats. So far, the earliest checked, the user manual example and the first production Yashica-Mat in the the database, 57xxx, which are the first of the few early examples with metre focusing scale, don't have the baffles and neither do another five with Lumaxar 75 mm lenses and focusing scales in feet. Thirty three examples, from 64xxx to 74xxx, with Lumaxar 80 mm lenses and the rare focusing scale in metres, do have the baffles. All still have the gold rings trim on the control wheels. A similar but slightly later example, 57103xxx, with the control wheels with black leatherette inserts does not have the baffles. 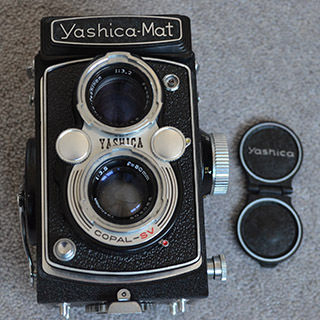 There are no Yashica-Mats in my database with Yashinon lenses and metre focusing scales (later cameras have dual scales).To put this another way, to have baffles, an early Yashica-Mat probably has a focusing scale in metres and still has the gold rings trim on the control wheels but has 80 mm Lumaxars already. One of the cameras with metre scales and baffles is from Belgium and the rest are from Japanese websites. As the model has a combined DIN/ASA film reminder scale, the small number of European export cameras were probably just diverted from domestic market production. It certainly seems that the Yashica-Mat baffles were only intended for the home market. It is also interesting that the greatest density of examples with metre scales fits into the range where baffles have been found so far, 64xxx to 73xxx. In fact, the Yashica-Mat, along with the Yashica 635, seems to have disappeared from 1959 brochures and perhaps became export only. Cameras with black leatherette inserts in the control wheel and Lumaxar 80 lenses with body serial numbers starting at around 79xxx to cameras with early Yashinons and the same trim with body numbers around 5880xxx have a problem with lifting leatherette. There are also other examples outside this range but they far more random. This issue seems to have been there from the beginning with a review of the Mat in The Singapore Free Press of 23 May 1958 commenting that “the leather covering was not adhering firmly in several places”. In addition to the pre-production example, the earliest Yashica-Mat in my database, serial number 574xx with taking lens 192xx and viewing lens 441xx, the second, also 574xx but 6 cameras further on and with taking lens 191xx and viewing lens 244xx, the third with taking lens 192xx and viewing lens 442xx, the fourth with serial number 590xx and taking lens 202xx and the fifth with 408xx and 456xx lens numbers, have the Copal MX shutter. Camera 596xx with taking lens 215xx and viewing lens 441xx is the first with an MXV shutter. The early Lumaxar 80 serial numbers continued from 42000+ but then dropped for some time into the 25000 to 39000 range. From the beginning, the Mat was fitted with the later single silver square hood with the early emblem (but with a gold stylised “Y” instead of monochrome on the other models). Initially, the name between the lenses was the Yashica oval and the control knob adornment was two concentric gold rings. 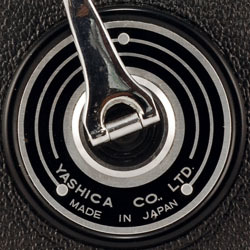 At about 73xxx, the control knob trim changed to the single black leatherette ring also seen on the very first Yashica Ds and 635s. The 5 digit serial numbers continued until about 85xxx (lens 100xxx). There are nine with six digit numbers, 790xxx to 792xxx with lens number 97xxx to 105xxx. These are followed by two odd numbers, both 5790xxx, one with lens number 107xxx. These appear to be “79” numbers with a “5” simply plonked in front, seemingly confirmed by the lens number. I think the change in style reflects the following fifteen 8 digit numbers, 57100xxx to 57121xxx (lens numbers in the 99xxx to 122xxx range). The last of these examples is 57121xxx with Lumaxar 80 taking lens 120xxx and viewing lens 110xxx. Another 57121xxx camera, some 400 cameras earlier, is the only example with Lumaxar 80 taking and viewing lenses both in the 201xxx range. Then there are thirteen cameras with seven digit numbers ranging from 5860xxx to 5881xxx, all with Yashinon taking and viewing lenses in the range 200xxx to 204xxx. The earlier number series with Lumaxar 80 lenses ended in December 1957. The new number series with Yashinon lenses seems to have begun in June 1958, suggesting a production break of 5 to 6 months. Possible reasons are explored in “The Camera”, above. However two slightly later cameras, another 7 digit camera 3890xxx and 8 digit 38120xxx, still have the earlier cover plates. The 8 digit numbers are followed by a new 7 digit series from 3910xxx to 3911xxx (lenses 217xxx to 218xxx), by my calculations, all from January 1959. At this point anyway, taking and viewing lens numbers are all very rational. Camera serial numbers suddenly jump to one example with 3980xxx serial number and then the range 4110xxx to 4120xxx; if my theory on the Serial Numbers page can be believed, these are from September and November to December 1959. What happened from February to October? There are no gaps in taking lens numbers which continue in the 219xxx range so it seems that there are no, or few, missing cameras from the intervening period. However, viewing lenses have jumped from 215xxx to 536xxx. That pattern of taking lens and viewing lens numbers is similar to the Yashica Mat-LM and may be a clue. The Yashica Mat-LM is claimed to be released in the last quarter of 1959 (I believe maybe announced but not on sale until early 1960). It is possible that Yashica wanted to wind back inventory of the Yashica-Mat and perhaps build up stock of the Yashica-Mat LM plus the Yashica Auto was also being produced for the Japanese market. Camera 4110xxx is also the first with the new black radial style control wheels and block letter style lettering between the lenses replacing the earlier “Yashica” oval. Back to 6 digit numbers in a block from 630xxx to 661xxx, these cameras signalled the change of the hood emblem to the narrow “Y” with blue background and introduction of the dual scale focusing knob. Then there are four nine digit serial numbers, the first is 146100186 and the last is 146100706, both shown below (the first is complete with <EP> mark). These cameras are also the first examples with mat silver control wheels. The next numbers started with MT 1030xxx (lens 248xxx). The two external pressure plate screws on the back disappeared at around MT 3010xxx. MT 3060xxx is the first camera without viewing lens serial numbers. Somewhere between MT 3020xxx and MT 5061xxx, the lens caps changed from the hinged alloy type to plastic. At MT 5061xxx, the control wheels changed to shiny silver (around 1965) but three cameras with MT 6110xxx numbers reverted to dull silver control wheels, viewing lens numbers and two screws in the back. They also have the narrow “Y” hood logo whilst cameras around them may have changed. They seem to be an odd batch and could be repair items. The earliest camera with the new wide “Y” hood logo is possibly between MT 5120xxx and MT 6050xxx. At around MT 7021xxx or a little before, the bars on the rear of the hood changed to black. 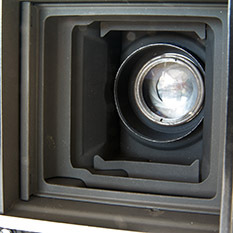 Between camera MT 8010xxx and MT 8020xxx (January and February 1968 respectively), the satin black focusing hood blind changed to a textured finish. The next camera after MT 9111xxx (lens 942xxx) is MT 0010xxx followed by MT 0030xxx (lens 956xxx) which is the last with f/3.2 viewing lens before changing to f/2.8. It is also the last with slotted screws used for the strap holders before the change to a cross head type. 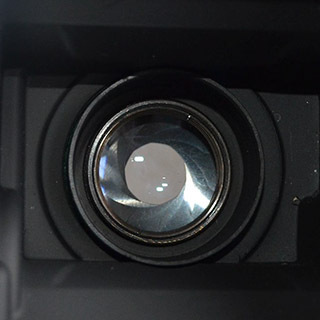 The next camera, MT 0060xxx is the first with the new viewing lens, serial number 986xxx. 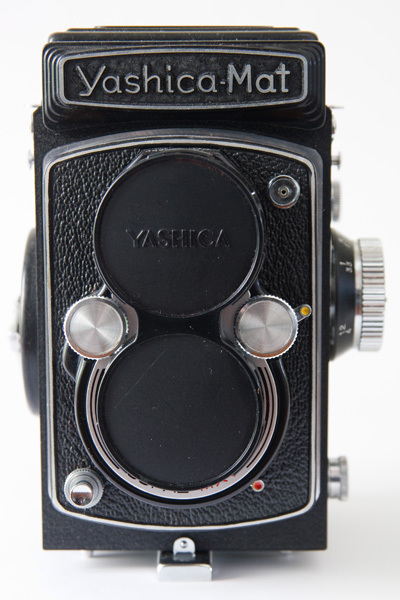 It is also the last with chrome metal locking knob before that changed to the black plastic Yashica Mat-124G type. This is followed by camera MT 0110xxx (lens 1010xxx) and camera MT 0110xxx (lens 1027xxx). The following camera starts a new series of lens numbers with 705xxx and is the first with a heavily patterned nameplate reminiscent of some earlier Yashicaflex models. This is followed by MT 1010xxx which seems to make sense sequence-wise until it is realised that the numbers seem to be repeating the first MT series numbers (predicted on the Serial Numbers page). The numbers increase to MT 1070xxx. 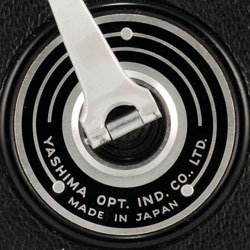 Of the 230 Yashica-Mats in my database, 135 have either “Yashima Opt. Ind. Co. Ltd” as the maker, or the earlier nothing, i.e. they are pre-1959 cameras. All bar the last 13 of the 135 have Lumaxar lenses (in other words, more than half the total) and the 75mm version are just under a quarter of the 122 with Lumaxars. As noted earlier, the 75 mm versions were only produced for a few months but with some 7,000 or so made, they are certainly not as rare or as hard to find as many sellers claim. Production finally ceased in early 1973, however, there are very few late ones in my database. In the beginning, the Yashica-Mat was an immensely popular model but by the end of the 1950s, interest in the 120 format, particularly by amateurs, was waning. At the same time, Yashica began releasing various metered iterations of the Mat and these seemed to be more popular than the original. By the end of its extended model run, very few were being sold. An interesting camera from both its position as the ancestor of the Yashicaflex B (new model) and the popular Yashica D and 635 models and also from a marketing perspective. It is claimed to have been released in May 1957 and in terms of specs and trim, it is clearly a later camera than the early Yashica A, C, LM and Yashica-Mat. With an updated shutter, it morphed into its successor, the Yashicaflex B (new model). As the model AS is one of three Yashicaflex cameras from 1957 recycling earlier names, I have decided to apply the commonly used collector invention for the other two of “(new model)” to this one as well. There are the two earlier Yashicaflex AS models (the AS-I and AS-II, collectively referred to by Yashima as “Yashicaflex AS”) and I initially couldn't accept Sugiyama's call that this model also had that name and thought that this was simply an early version of the Yashicaflex B (new model), which in the technical sense, it is. Minor trim changes and a shutter update of similar spec had not resulted in a new model in the past. 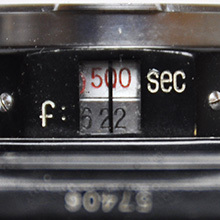 In the earlier context, “A” seemed to mean basic model and “S” seemed to mean Sekonic exposure meter. Why repeat those letters for this very different model when it is neither basic nor has an exposure meter? Elsewhere, I have proposed a theory that prior to an export push starting in 1956 with the Yashica A, C and LM, Yashima decided to re-brand all its new models “Yashica” but with regard to the home market and the success of the earlier “Yashicaflex” models, for a time it retained the “Yashicaflex” nameplate whilst marketing material alluded to “Yashica”. The “Yashica Model AS” on the instruction manual cover is undoubtedly an artefact of that process in the same way that there is both “Yashica A2” and “Yashicaflex A2”on the box and a “Yashica A2” ad for the Yashicaflex A2 model and both “Yashicaflex” and “Yashica” appear on the Yashicaflex B (new model) box and that both that camera and the Yashicaflex A (new model) are called “Yashica B” and “Yashica A” respectively in a Japanese brochure. This transitional period seemed to last about two years. 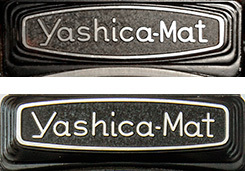 The new style Yashica nameplate had already appeared on the Yashica Rookie, Yashica A and Yashica-Mat and there was the earlier oval nameplate of the Yashicaflex C, the style of which was repeated with the Yashica C. The nameplate on the Yashicaflex AS (new model) is identical to those on the earlier Yashicaflex A-I, A-II, A-III and A2 models. Does it represent an intent to invoke a reference to the earlier Yashicaflex models? There is even good evidence that the the Yashicaflex AS box has been recycled, see here. Maybe even the ever-ready case. When the AS (new model) was released, the Yashica-Mat was certainly on the market already but whilst the Yashica-Mat received the new style ever-ready case with moulded top and front which was the harbinger of nearly all later cases, the Yashicaflex AS (new model) got something which seems identical to the earlier Yashicaflex A-II case, including the return of ribbing and embossed logo instead of metal. It seems to hark back to the style prior to Yashicaflex C and Yashica C and LM and even the Yashica A cases. Basically, the Yashicaflex AS (new model) adds the Citizen MXV (M-X sync and 1/400 top speed) shutter and Rolleiflex type aperture and shutter speed control dials from the Yashica-Mat (uniquely with leatherette disc inserts) to the Yashica C. It has the new locking lever (the Yashica-Mat as well as the earlier Yashica C and LM started with the bent strap type which confirms that this is later) and hood with single silver square. From the outset, it had fully automatic film counter reset unlike early Yashica C and LM examples. 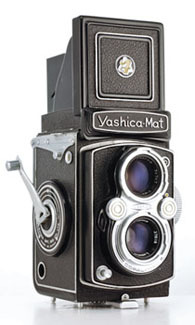 One feature that both the Yashicaflex AS (new model) and Yashicaflex B (new model) and also at least some very early Yashica-Mats and Yashica Ds shared was an internal light baffle (see “Internal Light Baffles”). After that, Yashica did not reintroduce baffles on 66 models until the Yashica-Mat 124G. All found examples have metre focusing scales and this is a rare camera in the west. 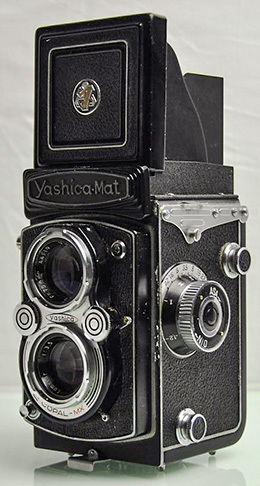 The first Yashica-Mats had focusing scales predominantly in feet suggesting that whereas the Mat was initially intended for export, the AS (new model) was a domestic model only. The last two cameras in my database (one with the highest Yashicaflex AS body serial number, the other with no body number visible but a high lens number probably making it a late example) are fitted with the control wheels with the leatherette ring insert of the Yashicaflex B (new model), rather than the model AS disc insert, and also a Copal MXV shutter replacing the Citizen MXV. It is possible that they are a late change to the specs but just to confuse matters, there are two earlier examples as well, the first from near the middle of the database. At least three of the four look like they are in very nice original condition with no obvious signs of fiddling by owners (all four still have their ever-ready cases and one also has its presentation and outer box, both in excellent condition). All four have lens numbers matching the body number or where that is not visible, other AS examples. From my experience, of other cameras where obvious repairs have been carried out using later parts, often the later lenses are also swapped over. Four cameras out of 52 is quite a few and suggests a possible weakness. I have a near mint model AS but it partially opens its Citizen shutter as it is being cocked. I understand that this is due to a broken/displaced spring in the shutter assembly and am aware of several other examples with the same problem. Perhaps Yashica's repair policy was to replace broken Citizen shutters with the Copal MXV from the model B which also necessitated using that model's faceplate and hence control wheels? No AS models with Citizen shutters have “Made in Japan” under the taking lens - this was introduced late in 1958 and only appears on the last of the Yashicaflex Bs (new model) and last Yashica Cs and LMs. One of the AS examples with Copal shutter (the nicest, the one complete with its boxes) has “Made in Japan” on its faceplate. As production of the AS undoubtedly ceased in 1957, clearly, the Copal shutter and its faceplate are a later addition, even if it looks like it left the factory that way. Someone may have cannibalized a broken model B to repair an AS but it would be hard to believe that 8% of the model AS examples in my database were repaired/modified by people breaking up the later model B, so in some way, I am fairly certain that Yashica had a hand in the modifications. There are fifty two in my database with body serial numbers ranging from 195xx to 287xx and taking lens numbers from mainly 701xxx to 877xxx, but with one 614xxx and several from 440xxx to 448xxx in the middle. Another name for Yashica D with which it shares all specs, or think of it as the preceding Yashicaflex AS (new model) (see above) with upgraded but similar spec Copal MXV shutter. The only difference with an early D is the name on the nameplate. 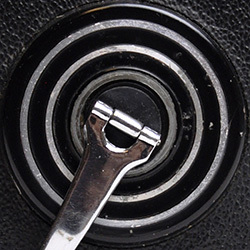 The generally metre scale focusing knob throughout its life suggests that this camera is also a domestic Japanese model. Claimed to be released in July 1957 and on sale until December 1960 but according to my understanding of serial numbers, production probably ended around September 1958 just prior to the release of the Yashica D which was also sold in Japan. 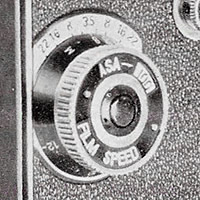 Supporting the 1958 date is that no examples have yet been found with the new combined DIN/ASA film speed reminder on the film winding knob which also first appeared in 1958. There are five exceptions with feet focusing scales. All four have 3340xxx serial numbers, from I believe April 1958, with around 900 cameras between first and last suggesting a small batch. Three are from Japanese auction sites and the fourth was from a seller who almost certainly imports cameras from Japan. That suggests that they were not originally intended for export. Perhaps some were produced with a feet scale to appeal to visiting Americans (at the time, it would have been the English and Australian preference as well). Also, the three of the five with locking knobs visible have “Made in Japan” - this is absent from the others with focusing scales in metres. The other obvious thing about the brochure is the reference to the camera as a “Yashica B”. Outside of Japan, the Yashica B is quite a different model with different feature set - it is the export version of the Yashicaflex A (new model). 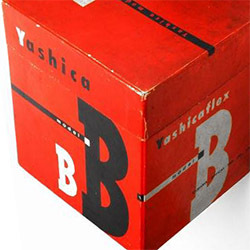 One side of the lid has “Yashica” which together with the box reads “Yashica model B”. Note, there is no mention anywhere of “New Model”; we can be certain that is collector invention! What we know as the later Yashica B has a blue-green box. Quite obviously, this camera was not intended for the same market as the other Yashica B. There is more here. There are 145 examples of this model in my database. There are no obvious trim changes in its short life but its serial numbers appear to follow similar patterns as the pre-prefix Yashica A, C, LM, D, 635 and Mat. I have arranged the numbers to match the patterns of the other cameras including alignment to what I believe is the Yashicaflex Showa based date code. This is the order that they appear in the database: 58xxx - 88xxx, 7x1xxx - 790xxx, 32100xxx - 32120xxx, 3310xxx - 3380xxx, 3890xxx - 3891xxx and 38100xxx. The taking lens numbers appear to be a continuation of the Yashicaflex AS (new model) pattern and get as high as 992xxx, then the final range is 200xxx - 448xxx. The last three examples of the Yashicaflex A in my database did receive the dual DIN/ASA film speed reminder in silver and black which was introduced across all current models. This model joins the “new” Yashicaflex AS and B from the same period, all of which recycled names from the past. The correct name is “Yashicaflex A” with “(new model)” added by Sugiyama and/or collectors to differentiate it from the earlier A-I and A-II models. 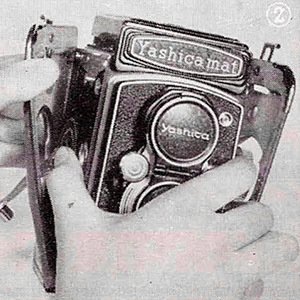 Below is part of a Japanese brochure (one of several) from around 1958 which clearly calls this model “Yashica A” even though the nameplate says “Yashicaflex”. Similar things happened with other Yashicaflex models from this period (see here) and is probably why the model known as Yashica A outside of Japan is called the Yashica A III in Japan. In fact, two of the Yashicaflex A (new model) examples have been found with typical yellow Yashica A boxes (also used for the A III). The Yashicaflex A (new model) is an almost exact equivalent to the more familiar Yashica B in general appearance and specifications except that the Yashica B has the later film reminder, a hood logo and was available in grey as well as black leatherette. The Yashicaflex A (new model) is without doubt an earlier domestic Japanese market version of the Yashica B. It has a metre scale focusing knob and the Yashica B is found with both metre and feet scales in addition to dual scales. From brochures, my guess is that the A probably replaced the A2 in Japan. It certainly wasn't a development of that model, more a different mix of existing features with some trim updates added. The advertised camera range in Japan at the end of 1956 was Yashica Rookie, Yashicaflex A2 and Yashicaflex C. In 1957, the Yashica-Mat was added to that range. In 1958, the advertised range changed to Yashicaflex/Yashica A (new model), Yashicaflex/Yashica B (new model), Yashica 635 and Yashica-Mat. At that point, it seems that the Yashicaflex A (new model) was the Japanese market entry level model, replacing the Yashica Rookie and/or Yashicaflex A2. I have placed this camera in accordance with the information in Karl Kahlau's book. By trim and serial numbers found so far, it certainly comes after the Yashicaflex AS (new model) and near the Yashicaflex B (new model). Because there are no trim changes, I have ordered the cameras in my database using patterns of serial numbers from other models of a similar vintage. The first example has taking lens number 807xxx. The second camera has 5 digit serial number 107xx (lens number 871xxx) and the third has 112xx (lens number 869xxx). These are followed by four cameras from 640xx 695xx and two cameras from 834xx to 862xx. Then there are three examples with 6 digit serial numbers 290xxx to 291xx and both taking and viewing lens serial numbers 884xxx to 894xxx so they seem to fit here. There is a single camera with 7 digit serial number 3290xxx and viewing lens 893xxx. Whereas the date code seemed to start with 79xxxx (September 1957) for most cameras and change to 3210xxxx for Yashicaflexes (October 1957), either the Yashicaflex A (new model) started with 329xxxx already in September, or it changed to that in the middle of the month. The next serial numbers have 8 digits and range from 32100xxx to 32111xxx (lens numbers up to 965xxx). My date code theory suggests that these are Showa dates which translate to October and November 1957. There are a couple with lens numbers only, up to 997xxx, before a change to cameras with 7 digit numbers 3350xxx to 3380xxx (May to August 1958). Their lens numbers range from 213xxx to 419xxx. The last camera has an eight digit body serial number 38110xxx (November 1958) and lens numbers 458xxx and 452xxx. The last three examples have the later black and silver combined ASA/DIN film speed reminder.